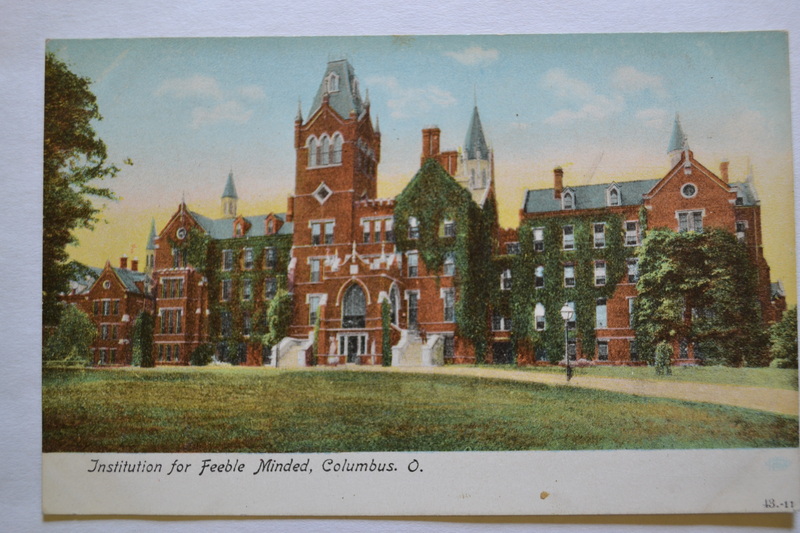 What’s the connection between the Center for the History of Psychology and National Postcard Week? Well, about 200,000 postcards donated to the CHP. 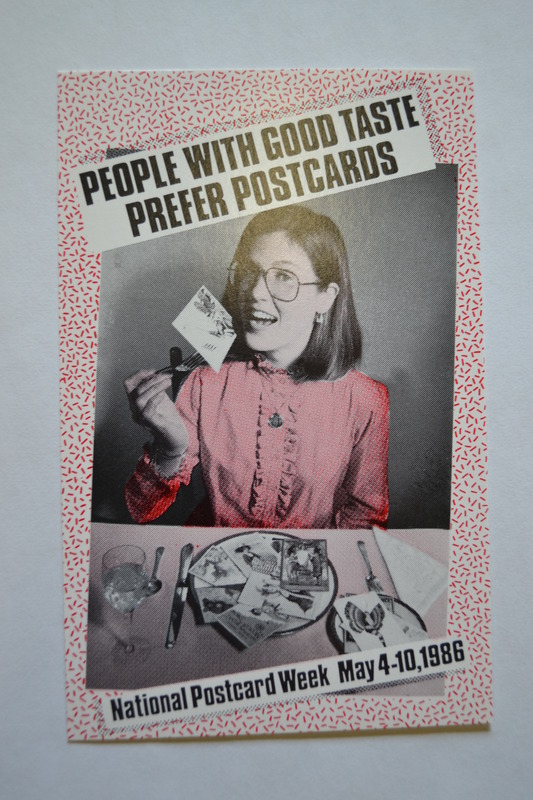 In honor of National Postcard Week and Dr. David P. Campbell who donated his collection of postcards to CHP, we are taking you on a behind-the-scenes tour of this vast collection of postcards that says as much about the art and psychology of collecting as the cards themselves say about cultural history. 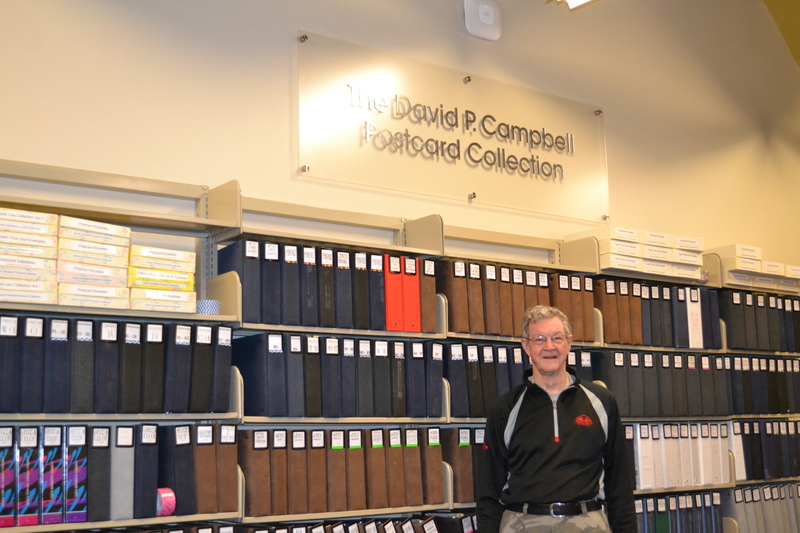 This vast collection has been acquired by Dr. Campbell over three decades and represents an historical look at natural and human science as well as global society and culture encompassing a variety of themes and images. 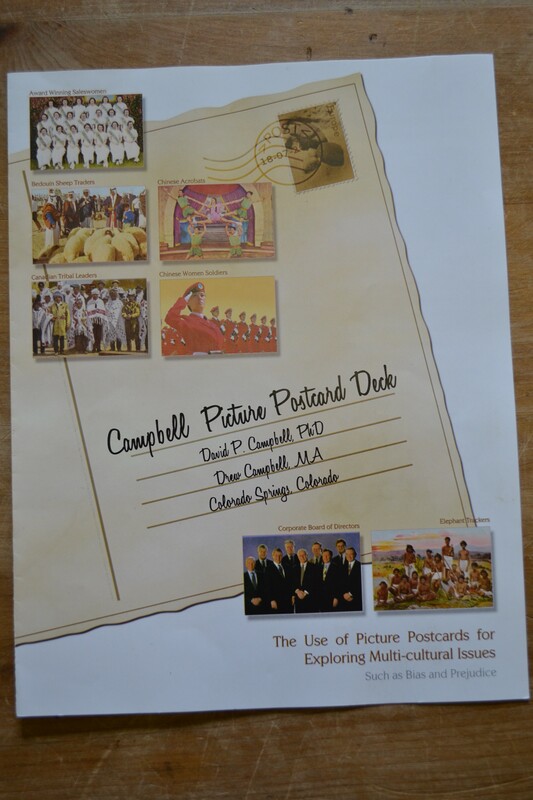 These images have been used by Dr. Campbell to explore multiculturalism and increase multicultural awareness. 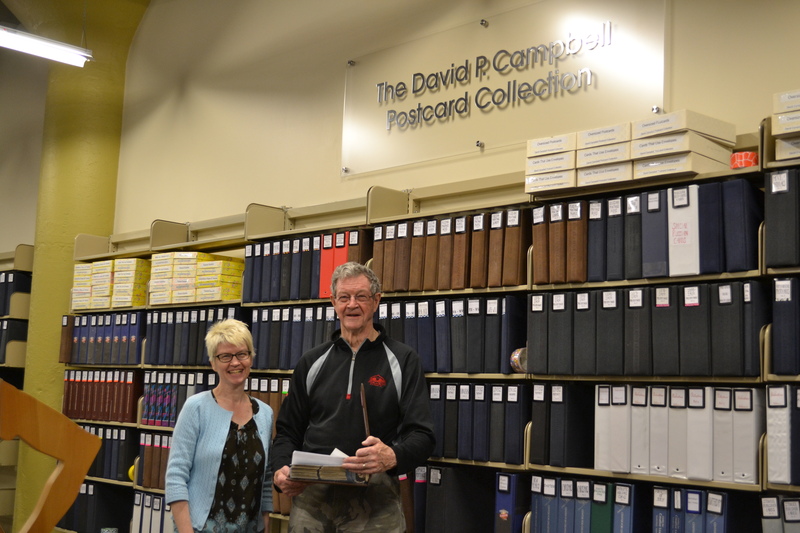 Last month, Dr. Campbell visited the CHP to help organize his large collection, and to get acquainted with the new space designated for the postcards. We worked hard to organize by material type, artist, theme, people, geographical place, and subject. 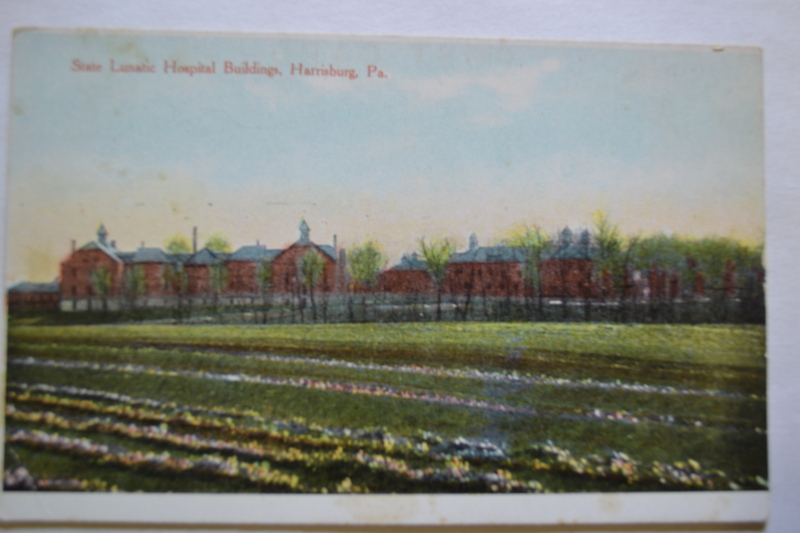 When all was finished, CHP had 182 linear feet of postcards from the 1800s to as late as 2008, all contained in 3-ring binders or postcard boxes to be viewed and studied by all. 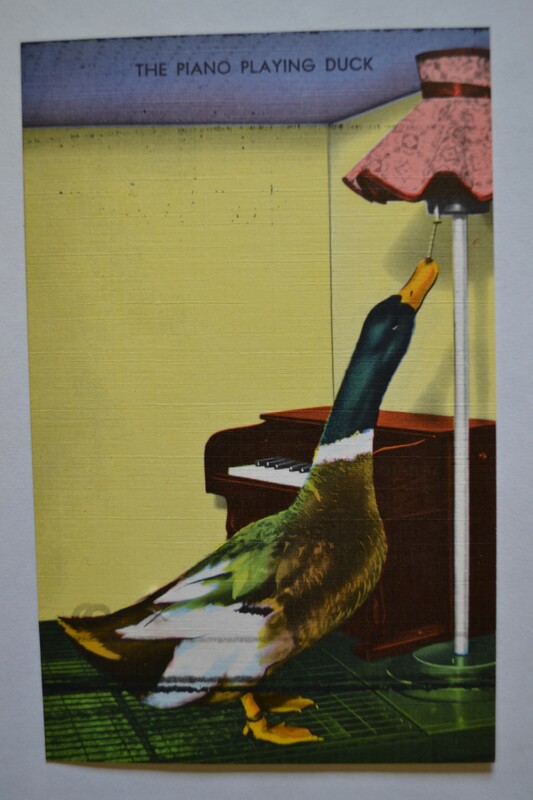 A particularly interesting find among the thousands of postcards, is the Piano Playing Duck, a postcard created for Animal Behavior Enterprises, Inc. in Hot Springs, Arkansas. 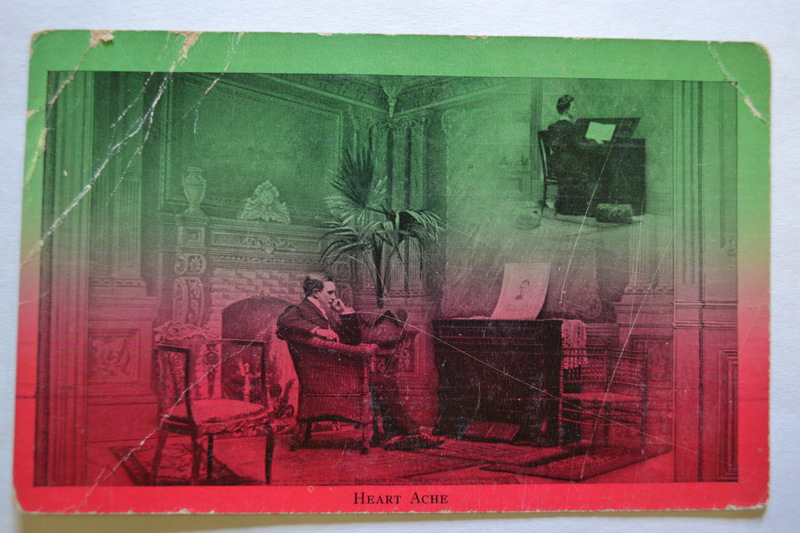 The image of a mallard duck turning on a light before he begins to play piano can also be seen along with animal performing props, advertisements, and manuscripts from the company right here at CHP! 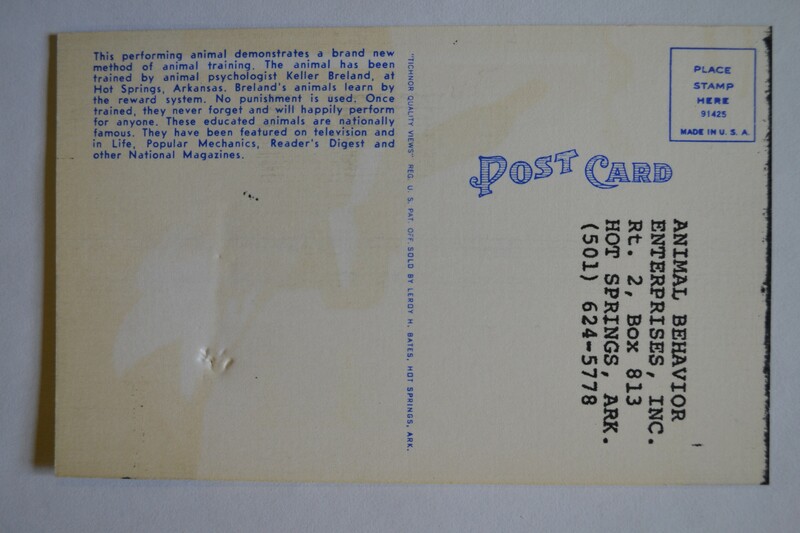 The Animal Behavior Enterprises collection includes many images of performing animals trained by animal psychologists Keller Breland and Marion Breland Bailey. As the newly-created Institute for Human Science and Culture at the CHP is launched, this collection seems even more relevant to the interconnectedness between psychology, culture, and natural science. 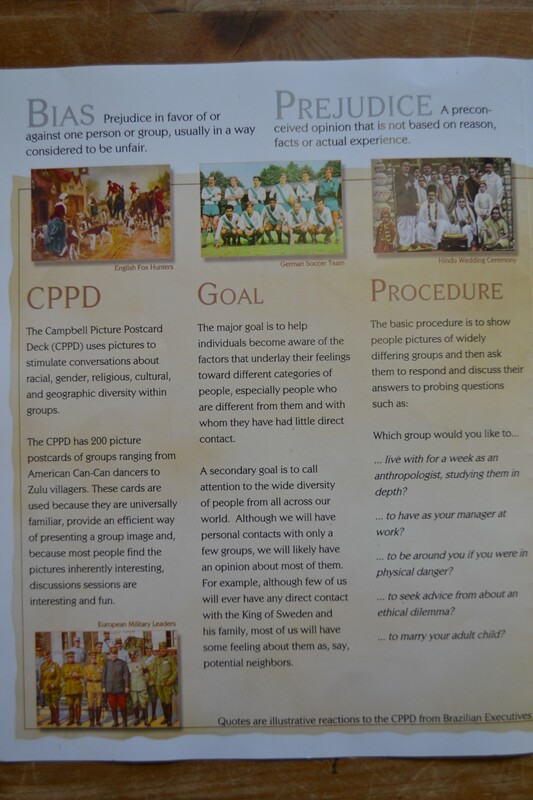 CHP is pleased to have this representation of cultural history throughout the world as a significant contribution to the Institute. The CHP is launching a new project, and we need your help! Dr. Robert H. Wozniak donated hundreds of books to the CHP; many of these books are rare, antiquarian, and written in a foreign language. These books are really amazing and document the history of psychology throughout the world. Because of their age and translation issues, these books can be difficult to include in the traditional library catalog. 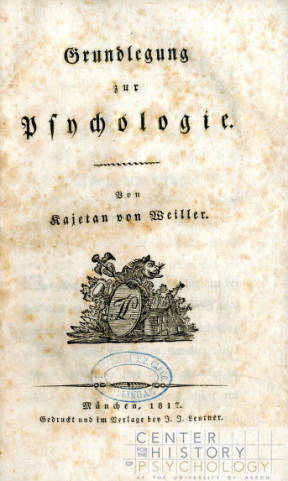 This German language book, Grundlegung zur Psychologie, published in 1817, is one of the titles from the Wozniak Collection of Books. The difficulties with cataloging won’t stop the CHP from providing access though! 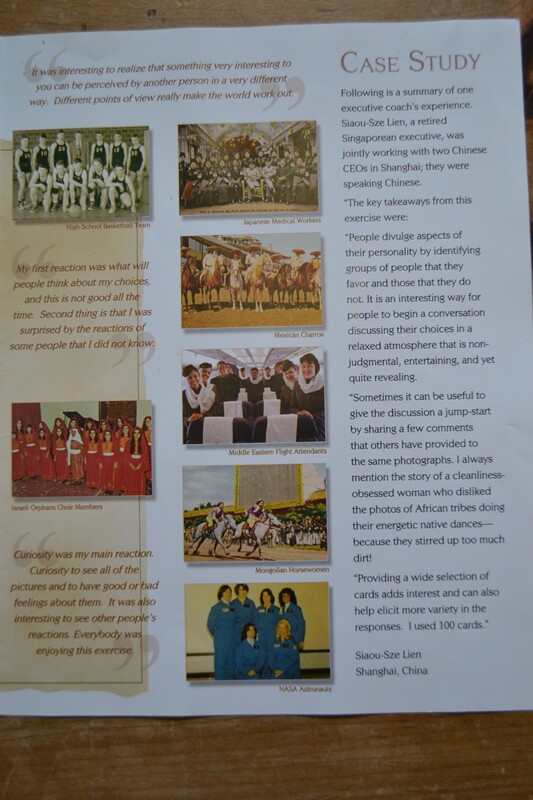 The title page, publisher information, and table of contents have been scanned and the images are included into CONTENTdm. 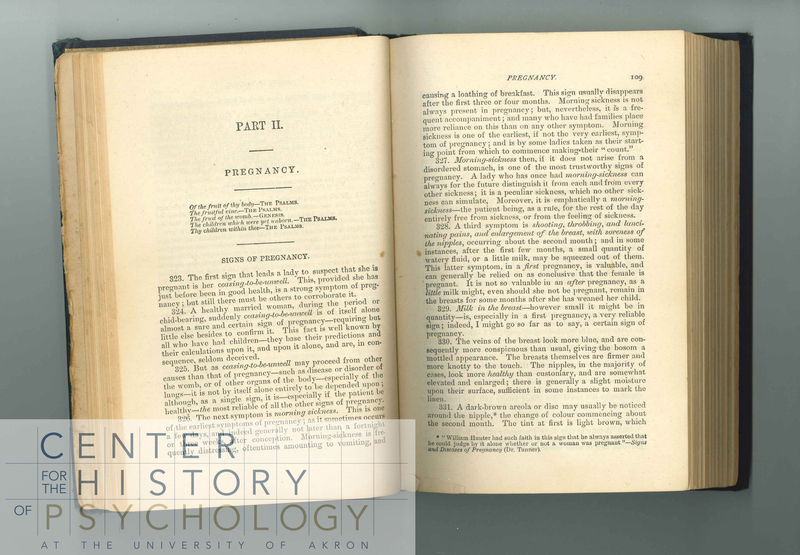 Take a look at the scans and browse the collection: Professor Robert H. Wozniak Collection of Books on the History of Psychology. How can you help? 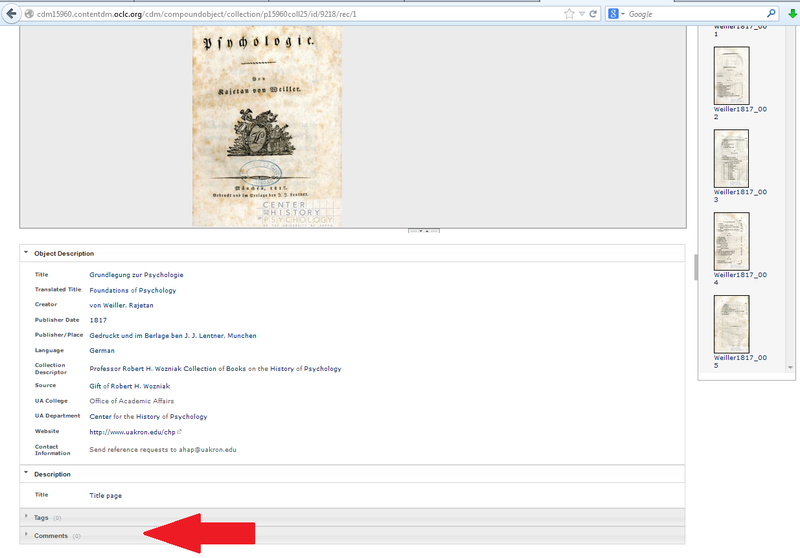 By translating the titles, table of contents, and other information from the scanned pages. At the bottom of each record, there is an area for “Comments”. Add your translations here; don’t forget to include your name. This will help make the book findable to researchers. More books are added weekly throughout the summer, so check back often. At the bottom of each record, there is an area for “Comments”. Add your translations here; don’t forget to include your name. 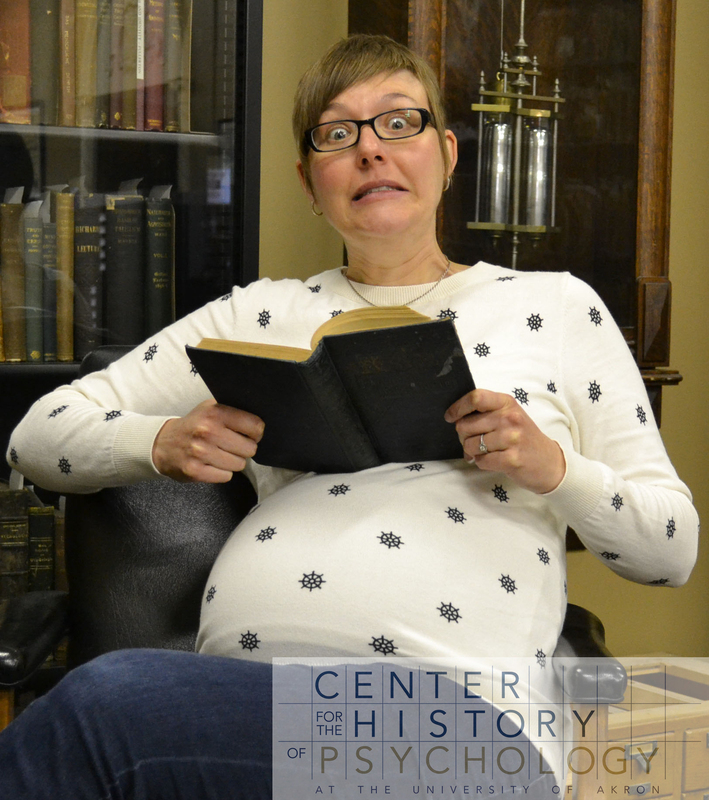 Lizette is the 38-weeks pregnant reference archivist at the Center. Being desperate for any shred of useful information to help with her impending labor and delivery and the subsequent keeping alive of a tiny human Lizette turned to the CHP’s book collection for guidance. 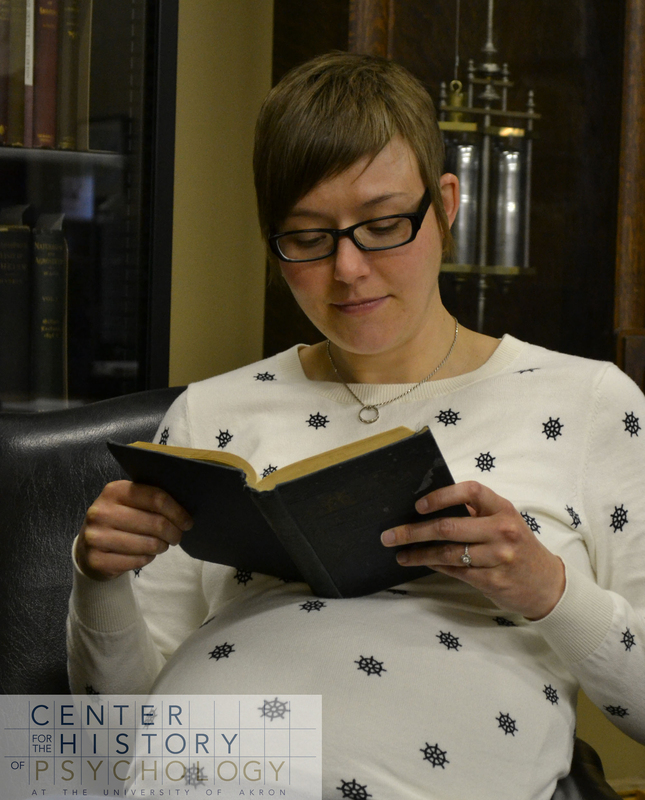 The Center’s book collection contains any number of texts on parenting and child development but there was one title (located with the help of Digital Projects Librarian Jodi Kearns) that really stuck out. Pye Henry Chavasse’s Advice to a wife on the management of her own health and on the treatment of the complaints incidental to pregnancy, labour, and suckling with an introductory chapter especially addressed to a young wife. Pye Henry Chavaase’s (1810-1897) medical practice focused on women and children and he became well known for his popular medical books, including the title I selected for this edition of CHP’s Book of the Month series. 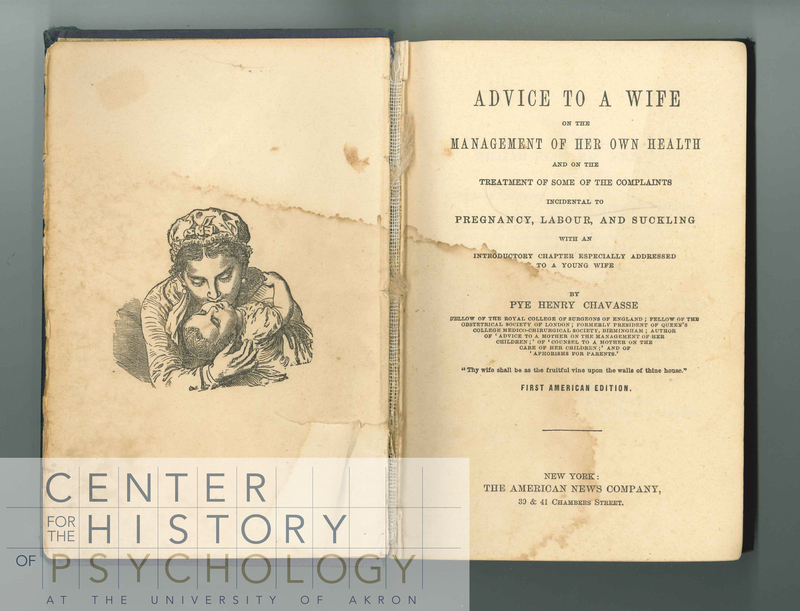 The copy of Advice to a wife… here at the center was published in 1878 and the title page claimed it was the first American edition and the thirteenth edition overall. The book was originally published in London in 1839 and was translated into numerous European and Asian languages. This book was immensely popular and in fact, I discovered a “classic reprint” edition on Amazon that was published as recently as 2012. Chavasse’s text is written as a numbered list of suggestions and helpful hints to get a woman through marriage, menstruation, pregnancy, labour, and suckling. And also helpful, the latter part of the book includes an additional text, Advice to a mother on the management of her children and on the treatment on the moment of some of their more pressing illness and accidents. Whew! This book has all of the bases covered! 1. It may be well – before I enter on the subjects of menstruation, of pregnancy, of labour, and suckling- to offer a few preliminary observations, especially addressed to a Young Wife. Well, I’m not exactly a young wife according to 1878 standards but I decided to flip through this introductory section anyways in the hopes of gathering a few gems. Super! I do live on a farm in a rural community so I guess I’ve got that going for me. Woohoo! Finally that big pay day I’ve been waiting for! I glossed over this section. As a 33-year-old woman I consider myself well versed in this area. 355. The longings of a pregnant lady are sometimes truly absurd….They long for suckling pig, for cracklings of pork…for anything that is unwholesome…. 402. 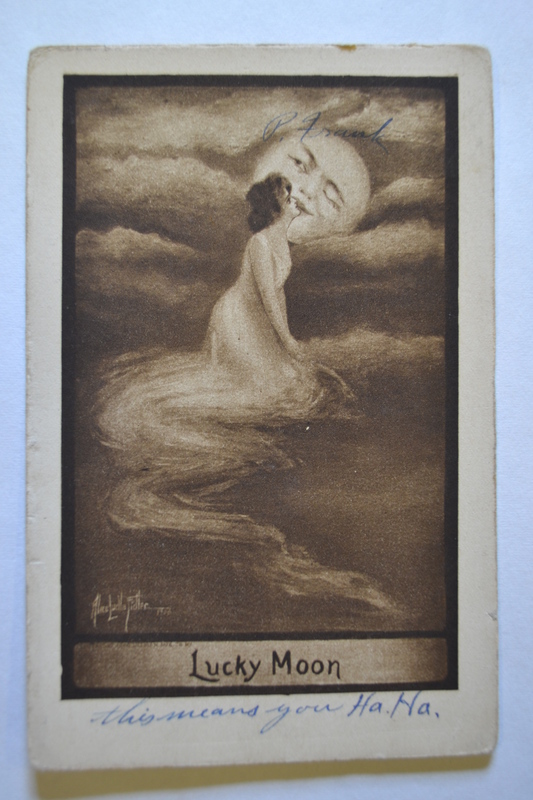 A lady who is pregnant is sometimes restless at night – she feels oppressed and hot. Amen Chavasse. But your suggestions of lowering the sash of the window and enjoying cooling summer fruits aren’t exactly the helpful hints I was looking for. 640. When a woman marries later in life – for instance after she has passed the age of thirty – her first labour is usually much more lingering, painful, and tedious…. 726. As soon as she is settled in bed, there is nothing better than a basin of warm gruel. Really? After creating and delivering human life the best thing I’ve got going is a basin of warm gruel?! 792 Ponder well, therefore, before it is too late…health of mother and health of babe, human life and human happiness are at stake and depend upon a true decision. Sheesh Chavasse. You’re really applying the pressure when it comes to breast feeding. No worries. I don’t know any wet nurses anyways. 830. A moderate quantity either of fresh mild ale or porter will generally be found to be the best beverage for both dinner and supper. There is much more nourishment in either…for a nursing mother…. Okay Chavasse! Now you’re talking! Dr. Pye Henry Chavasse covers a lot of ground in this book and as I’m sure you can see I only selected a few choice tidbits for this blog. His writing is frank and medical minded and was intended for a wide audience. I can certainly see how this book would have been helpful to women in search of sound medical advice during a time period we often associate with modesty and prudence. Chavasse concludes by stating, “I fervently hope that this little book will…be to my fair reader, during her whole period of wifehood, a friend to her need, a guide to her difficulties, and a silent but safe counsellor in all things pertaining to her health.” While I’m not exactly sure I’ll keep a copy on my bedside table an ice cold ale does sound pretty good right now. Wish me luck folks. I’m about to be somebody’s mother.